Laser etching, laser marking and laser engraving provide a permanent message on an in-process or finished component. We can laser etch text, serial numbers, part numbers, company logos, bar codes, QR Codes, ID matrix codes or 2D codes on all plain, painted, anodized, or plated metal surfaces, whether they are flat sheets, curved surfaces, or cylinders. Laser engraving also produces very high quality permanent marks on most plastic materials. 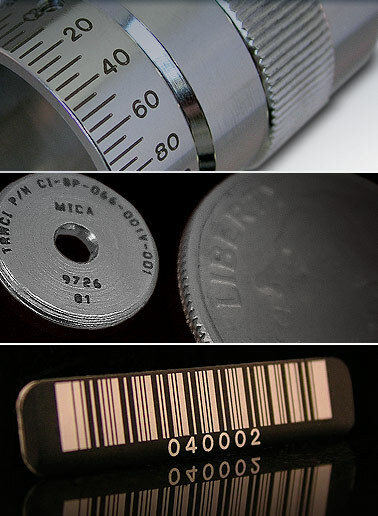 A character as small as 0.010 inch and as large as 12 inches can be marked with our laser systems. Laser Impressions Inc. provides laser marking, laser etching and laser engraving per AS478 for military, aerospace, automotive, medical and industrial applications. Additionally Laser Impressions Inc. processes and procedures are structured under ISO 9001:2008 and ISO 13485:2003 to ensure quality and repeatability for your laser marking and laser engraving requirements. © Copyright 2019 Laser Impressions Inc., Inc. All rights reserved. "Laser Impressions Inc." is a registered trademark of Laser Impressions Inc..